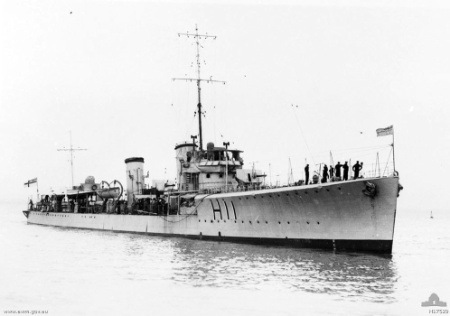 The picture to the right is of HMAS Swordsman – an S-Class destroyer of the same type as HMS Seraph. Swordsman was presented to the RAN – photo is from the Australian War Memorial collection. It was back on 9 March 2009 that the terms “HMS Seraph” and “Empire Seraph” were used in a search of Thomo’s Hole. I have, recently, been doing some reading and I came across a couple of Seraphs. So, if you were the one searching HMS Seraph or Empire Seraph, here is what I have found about the Seraphs. There were two – one was a submarine – good with its gun, not so good with it’s torpedoes and even better for secret missions – that sailed during and survived World War 2. The other was an “S” Class Destroyer built towards the end of World War 1 and which was scrapped, I believe, without a shot being fired in anger. 67 destroyers were built from 1917 onwards. They were built to a design for the Royal Navy. the design was based on the Admiralty modified R-Class. All ships in this class had names starting with “S” or “T” and vessels sailed in the Royal Navy, the Royal Australian Navy and the Royal Canadian Navy. These vessels were built by a number of yards, including Thornycroft, Yarrow and Denny. Of the 67 vessels built, most were not commissioned until after World War 1 and the majority had been scrapped before World War 2. The most unusual feature on these vessels was the long forecastle and the placing of the bridge aft of the break un the main deck. Seraph was built by Denny, laid down 4 October 1917, launched 8 July 1918 and completed 25 December 1918. She was sold for breaking up May 1934. 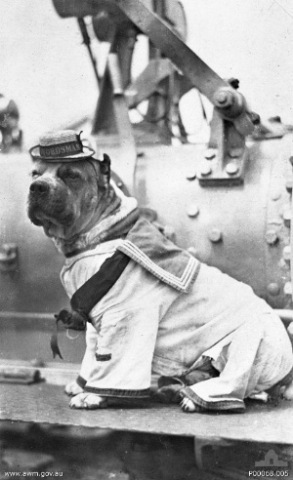 Bearing no relationship whatsoever to the s-class submarine but looking cute, the dog shown to the left is the ship’s mascot from HMAS Swordsman pictured above – the photo was taken circa 1925 and is from the collection at the Australian War Memorial. Probably the most interesting of the Seraph vessels is the submarine HMS Seraph. Her pennant number was P219 and she was an S-class submarine or the Royal Navy. I am guessing that this is the HMS Seraph that the inquiry was about. Seraph saw some action in the Mediterranean. In late 1942 she attacked a convoy west of Marettimo Island. She fired four torpedoes at the Citta di Tunisi and missed. A few days later she attacked another convoy west of Marettimo Island again, fired four torpedoes at the German transport Ankara … and missed. In late 1943 Serpah had more luck using her deck gun and over a two month period she sank four small craft east of Corisca, then the Greek sailing vessel Aghios Militiades with gunfire off Kaso Strait east of Crete, and then the Narkyssos off Karpathos, Greece, also with gunfire. She also took part in a number of intelligence and special operations during World War 2. The event the Seraph was most remembered for, however, was her involvement in Operation Mincemeat which was a very successful British deception plan during World War II. This convinced the German high command that the Allies planned to invade Greece and Sardinia in 1943 instead of Sicily, the actual objective. The operation took a dead man, gave him a false identity and a set of papers outlining the attack plan and then having HMS Seraph deposit the body near the coast of Spain where it was sure to be found. The story was revealed in the 1953 book The Man Who Never Was as well as the movie, the Man Who Never Was – one of my favourite Clifton Webb movies. Seraph was one of the third batch of S-class submarines, built by Vickers Armstrong at Barrow-in-Furness. She was laid down on 16 August 1940, launched on 25 October 1941 and commissioned on 27 June 1942. She was finally scrapped at Briton Ferry, Wales on 20 December 1965. Many ships during World War 2 were called Empire [something]. These “Empire” ships were a series of ships in the service of the British Government. The prefix of “Empire” was to indicate that the ship was owned by the Ministry of War Transport (MoWT). The MoWT generally contracted the management and running of the ship to the various shipping lines, although, of course, their orders were given by the British Government. The ships were acquired from many sources, including being built for the MoWT themselves, purchased from the USA or captured or seized from enemy powers. Some ships were also prefixed with the “Empire” prefix during the Suez crisis in the 1950s. The Empire Seraph was a 129 gross ton tug built by Cochrane & Sons Ltd, Selby, Yorkshire, in Britain. She was launched on 25 October 1942 and completed in December the same year. After her war service, she was sold to the Polish government in 1947. They renamed her Bizon. Bizon was finally deleted from the ship registers and stopped sailing in the 1960s. As the Empire Seraph was a 129 tug taking into service and not one of the more “flashy” naval vessels of the time, I can’t see me being able to track down a picture of the Empire Seraph or indeed even the Polish Bizon for that matter.